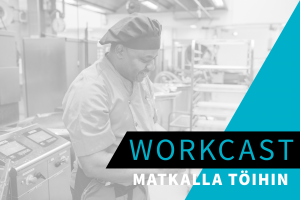 Satu Aaltonen, project research from SWiPE, and Anu Yijälä, project manager from Polkuja työhön project, discuss in this week’s Workcast about how immigrants coming to Finland can be included into working life, how they become entrepreneurs and what guidance they need for their employment and entrepreneurship paths. In the “Arjen ääni” (voice of working days) interview we hear entrepreneur Edem Agbekey-Taylor’s thoughts. The interview with Edem Agbekey-Taylor, originally from Ghana, and her way in becoming an entrepreneur in the natural cosmetics industry confirm the research results in the practical level. In this case Edem had to reconsider her own employment when job corresponding to her education was not found in Finland. – An educated person may have to go back to the start. However, it appears that it is important for a later job or for entrepreneurship that immigrants get any work, says Anu Yijälä in the Workcast. According to Satu Aaltonen, the meandering path of employment is quite typical for immigrants, but also for the Finnish people – life comes and goes with a variety of changes to the original plans. Both Satu Aaltonen and Anu Yijälä stress the importance of building networks. Many things proceed through networks and often to immigrants, strengthening networks can take place, for example, through hobbies. Many times, the way in which an immigrant entrepreneur can differentiate in Finland is the introduction of a special feature, for example from his/her own homeland, as Edem did. She used the old Ghanaian tradition of her skin care product series. Immigrants have a great deal of enthusiasm at the beginning to enter the labour market or become an entrepreneur. However, there are many licensing processes in Finland and the employment takes time, which may discourage the person. – The initial difficulties of immigrant entrepreneurship are largely the same as the Finnish entrepreneurs and the division between immigrant entrepreneurs and Finnish entrepreneurs is sometimes artificial. However, common denominators for immigrant-background entrepreneurs are challenges in terms of culture, business opportunities and market sentiment, says Satu Aaltonen. According to her, the incorporating of a company itself is not challenging in Finland, but tax, salary, other regulation or acquisition of finance may pose challenges if the person does not have a bank history in Finland, for example. The language skills in Finnish makes it usually easier to get a job and to become an entrepreneur. Immigrants themselves have a responsibility for their own employment, but other support and opportunities from the society are also important. – Immigrants want to work. Let’s give them a chance, emphasizes Anu Yijälä. – Immigrants are very persistent and are always striving forward. It gives us hope as we struggle with the needs of workforce, adds Satu Aaltonen. Listen to the story of Edem, a Ghanaian automobile mechanic who becomes a natural cosmetics entrepreneur in Finland, as well as SWiPE researcher Satu’s and Polkuja työhön researcher Anu’s discussion of what challenges immigrants face and how immigrant employment and entrepreneurship can be promoted in society, including using research results. How immigrants integrate to working life and entrepreneurship in Finland?